Mexico's U.S. ambassador says willingness to share an "encouraging sign"
(CNN) -- The United States shares the blame for Mexican drug trafficking and the attendant violence that has killed thousands in the past year alone, Secretary of State Hillary Clinton said Wednesday. 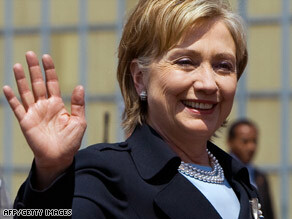 Secretary of State Hillary Clinton is in Mexico for a series of meetings on the drug crisis and other issues. Clinton will meet with President Felipe Calderon and other Mexican leaders to discuss bilateral strategies for the drug war. But her aides said she will also make an effort to show that the U.S.-Mexican relationship is not restricted to matters related to drug violence. She emphasized that the United States has already appropriated $700 million in aid to Mexico, and Congress wants to see how the administration is applying it before sending more. "We are going to demonstrate that we are spending it in an accountable and effective manner that will assist the Mexicans" in law enforcement and justice, she said. Anderson Cooper is live from the U.S.-Mexico border as the drug war fuels violence. The United States needs to stop the flow of guns, body armor and night-vision goggles to the cartels, Clinton said. "When you go into a gunfight or are trying to round up these bad guys and they have military-style equipment that is much better than yours, you start out at a disadvantage. Since we know the vast majority of that comes from our country, we are going to help stop it from getting there in the first place." In most instances, local and state police "are outgunned by the drug syndicates," which has necessitated the use of federal forces, he said. The Mexican army arrested a man Mexico calls a top drug cartel chief and four of his bodyguards, the government announced Wednesday. Hector Huerta Rios, also known as "La Burra" or "El Junior," was arrested Tuesday in the city of San Pedro Garza Garcia, outside Monterrey in Nuevo Leon state, a little more than 100 miles from Mexico's border with the United States. The Obama administration announced a crackdown on border violence and on the smuggling of cash and weapons into Mexico on Tuesday, a step that could mark an end to a nasty blame game over where responsibility for the violence lies. Clinton called the fighting "a terrible law-enforcement problem" in U.S. cities along the Mexican border, but said it does not yet pose a major threat to overall U.S. security. "This is more about trying to act proactively," she said in an interview with CNN's Jill Dougherty in Mexico City. "We need to help them, or we'll see the results in our own country. "[Traffickers] are distributing these drugs in our country. They're causing all kinds of criminal activity in our country. It has an effect on us, so we want to prevent it from going any further." Clinton will visit a Mexican police base to show U.S. support for the nation's embattled police force. And she will travel to Monterrey, a thriving industrial town, to meet with students, hold a town-hall meeting with business leaders and visit a clean energy plant. The Defense Department and the director of national intelligence have both warned of the national security threat an unstable Mexico poses to the United States. Congress has seized on the issue, holding eight hearings since coming back into session two months ago. Homeland Security Secretary Janet Napolitano testified at a Senate Homeland Security Committee hearing on violence along the U.S.-Mexican border Wednesday. Mexico is the United States' second-largest export market, after Canada, and its third-largest total trade partner. Hundreds of U.S. companies have factories in Mexico, and Mexico is a leading supplier of crude oil to the United States. Clinton noted many Americans have close ties and families in Mexico, adding she honeymooned there. Napolitano and Attorney General Eric Holder are due to visit Mexico soon, to be followed next month by President Obama, before he attends the Summit of the Americas in Trinidad and Tobago.